I’AM sipping tea where scholars and intellectuals tried to shape a new Taiwan and forge democracy during Chiang Kai Shek’s murderous White Terror period. A place which became a secret meeting venue for political dissidents and avant-garde artists during the brutal crackdown after Taiwan’s pro-democracy Kaohsiung Incident in 1979. A house which was a setting for Ang Lee’s Eat, Drink, Man, Women. Taipei’s Wistaria Tea House (紫藤廬) is a monument to Taiwan’s history. 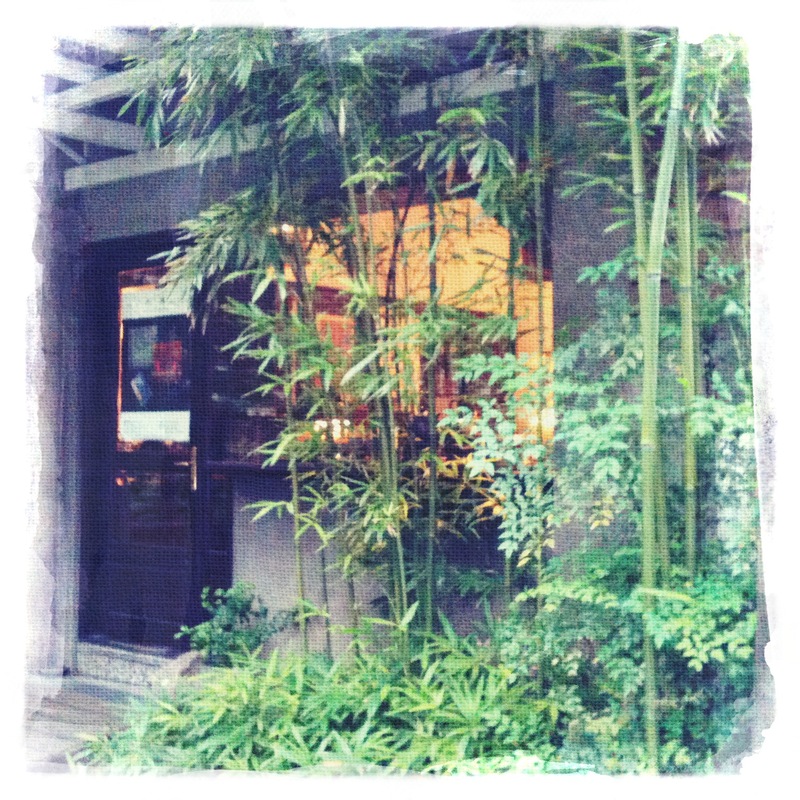 Outside the sky is grey and the wind is whistling through the tall and proud bamboo in the garden. Bright orange koi dance in the pond oblivious to the gale and the elements that have been battering me on my walk through Taipei’s DaAn district. I have escaped into the warmth of Wistaria Tea House’s wooden interior which is embracing me the way a mother does to a child during a storm. I’m safe from the wind, rain and Taipei traffic. I am in another world. Taiwan tea houses are places to reflect alone or enjoy the company of friends while slowly spending hours consuming some of the world’s best teas (Taiwan produces the best oolong and green teas in the world with the teas from Alishan fetching incredibly high prices). Wistaria Tea House is one of Taipei’s official historical sites and you can’t appreciate it unless you know some of its history and how it is intertwined with the recent history of the Taiwanese struggle for democracy. The home was built in 1921 and up to 1945 it was an official residence of the Governor-General of Taiwan during Japanese rule. From the 1950s, owner Professor Chou Te-wei (周德偉) an acclaimed economist of the period and a group of leading academics met there regularly to discuss, study and promote western liberalism in Taiwan. Together, this group published Free China (自由中國), a newspaper that advocated liberalism and which was sharply critical of the ruling Chinese Nationalist Party or Kuomintung (KMT). In the late 1970s Chou’s son, the intellectual and political dissident Chou Yu (周渝), became the custodian of the property and transformed it into a cultural space for avant-guard artists, social activists and the like. After the Kaoshiung Incident in 1979 when the KMT violently suppressed a pro-democracy protest, Chou took an active role in the opposition movement, circulating flyers on the streets, supporting political prisoners and their families and posting protest placards near his house on what became known as the democracy wall. In 1981, Chou turned the house into the present day Wistaria Tea House, and because of Chou’s activism, Wistaria Tea House served as a meeting place for political dissidents against the one-party KMT that had controlled the island since it landed in 1949 and imposed a 38-year period of oppressive martial law (known as the White Terror) which was only lifted in 1987 and making it the longest continuous period of martial law imposed in the world. During this time thousands of Taiwanese were arrested, tortured, imprisoned and executed for their real or perceived opposition to the KMT. Taiwan now has democracy and while some of Chou’s comrades have made names for themselves in Taiwan politics, Chou Yu is now devoted to educating, reviving and preserving Taiwan’s tea culture. 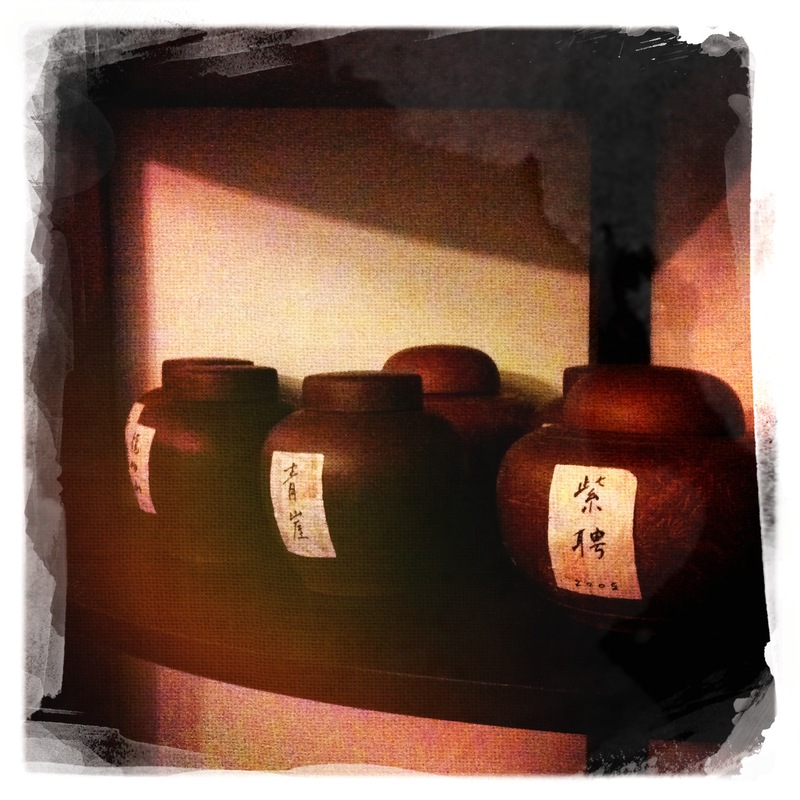 side kettles, standard in any Taiwan teahouse, will be refilled when empty, usually for an extra, but small, water fee. That’s the wonderful thing about visiting a Taiwan tea house, you can stay as long as you like, any tea that is not consumed is put in a tea canister for you to take home. The tea menu is extensive and proudly feature Taiwan’s best teas. You can enjoy one cup of tea, buy a small portion of tea for a tea ceremony or buy a packet of tea (any unused tea is yours to take home). Oolong and green tea are prominent and aficionados can order aged and cellared teas – such as the 60-year-old Sun Yi Sun Liu An tea (which resembles a puerh tea and is believed to have medicinal qualities) some of which are the most expensive on the list (ranging from NT$1000 for a personal pot to NT$3000 for a large pot (12 grams)), and the Aged Winter Ding Dong Oolong from 1943 (up to NT$40,000). A small variety of tea snacks are also available such as green bean cakes and other morsels. I ordered a portion of the Lee Mountain Early Morning oolong (NT$330) which is harvested on Central Taiwan’s Lee Mountain and the date and walnut slices (NT$80) as a tea snack. 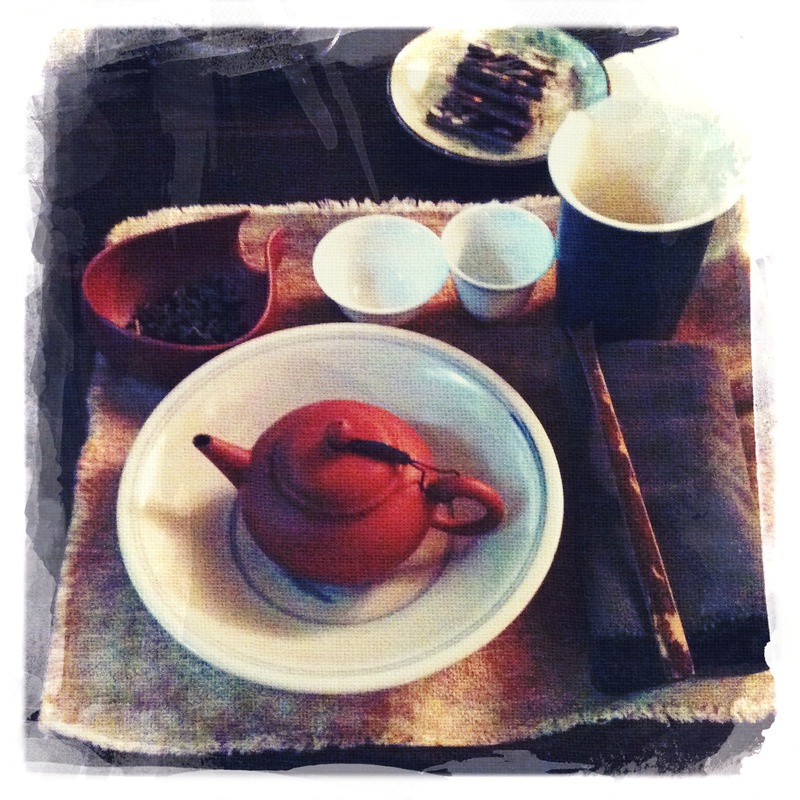 The assistant brought the typical Taiwan tea set – a dark wooden tray with a cloth liner and featuring the usual array of tea implements: small Yixing clay teapot, sniffer cup, drinking cup, chahai (decanter), wooden spoon, tea pick, warming bowl, and the portion of the sweet smelling beads of oolong. There is a certain ceremony one must perform to get the best out of your tea in Taiwan (based on the Gongfu cha method). Thankfully I learnt this ceremony during a previous visit to a Taiwan teahouse years before but the staff are happy to show you (as it is to be repeated after every third to sixth steeping depending on the variety and quality of tea). Boil water on the side burner. Rinse the Yixing teapot with hot water (usually using some of the boiled water from the side kettle. Rinse the tea leaves by filling the pot with hot water up to half full and draining the water immediately leaving only tea leaves behind. (This step, and all subsequent steps involving pouring water, should be performed in a large bowl to catch any overflow). Pour more hot water into the Yixing teapot, replace lid, and pour water over the teapot in the large bowl. Bubbles should not be allowed to form in the teapot. The infusion should not be steeped for too long: 30 seconds is an appropriate maximum. Pour excess tea from the first infusion, and all tea from further infusions, into a chahai (decanter) after steeping so as to maintain consistency in flavour for subsequent cups. It is possible to draw five or six good infusions from a single pot of tea, but subsequent infusions must be extended somewhat in duration to extract maximum flavour: the second infusion extended by approximately 10 seconds to 40seconds, the third extended to 45, etc. Onlong tea is better prepared in a clay pot, and green tea in a porcelain tea pot, as a clay pot has pores that can absorb the tea flavor. My oolong was light straw in colour with a soft honey scent (not as powerfully robust or woody as some of the oolongs I have had). The tea had a typical herbal/fruity oolong flavour with a subtle nougat tones. I am, however, normally partial to a strong and robust oolong – something with some extra kick would have been more my style but nonetheless it was an enjoyable brew to reflect and relax in such warm and wonderful surroundings. the third and fourth steeping are the best) and I discarded my leaves after the fifth steeping. The date and walnut slices were sweet but not overpowering therefore not interfering too much from the enjoyment of the tea. Pondering and reflecting for close to two hours I finished my portion of tea and ventured back into the dark skies of Taipei. The verdict: A sophisticated tea house which provides the perfect atmosphere and introduction to those who want to experience the Taiwan tea ritual in an old Taipei treasure steeped in history. 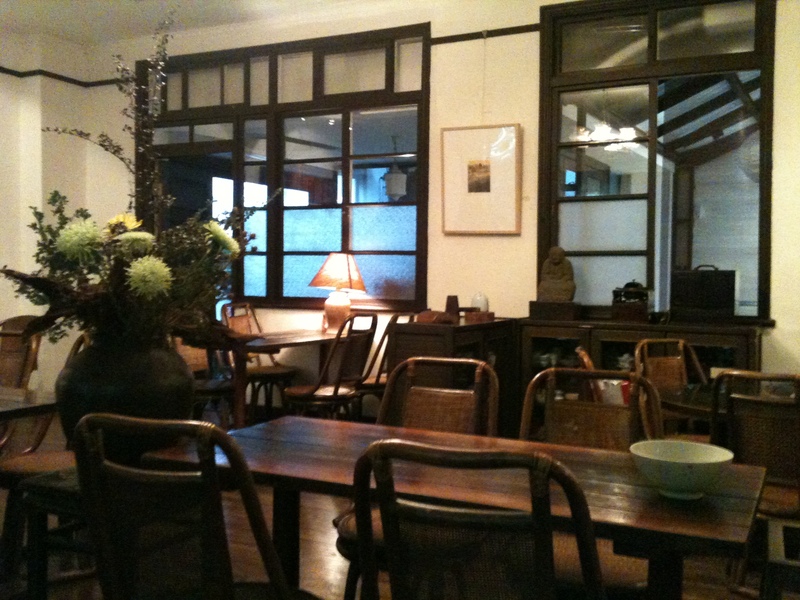 What: Wistaria Tea House (紫藤廬) No. 1, Lane 16, Sec. 3, Xinsheng S. Road, Da-an District, Taipei 106, Taiwan. Tea service 10am to 11.30pm; Lunch 11.30am to 2pm; Dinner 5.30pm to 8pm. Ate (drank) there: 15 November 2010. Note: NT$1 = A$0.30 and $US 0.30. 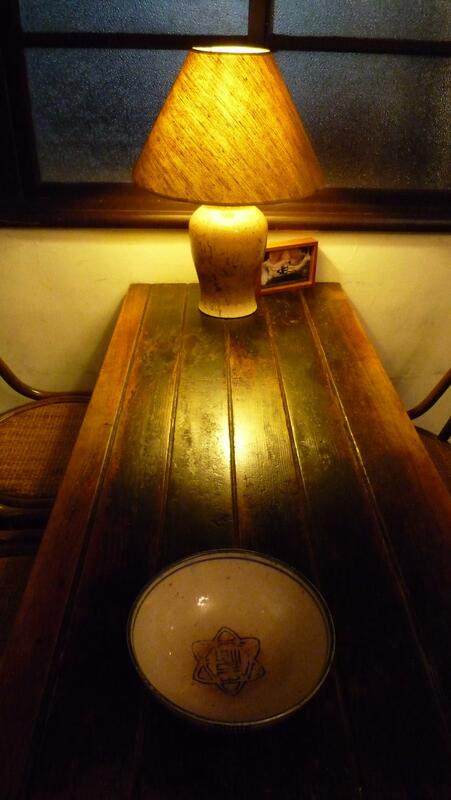 This entry was posted in Taiwan, Taiwanese and tagged 紫藤廬, Food, Taipei, Taiwan, Tea, Wisteria Tea House. Bookmark the permalink.